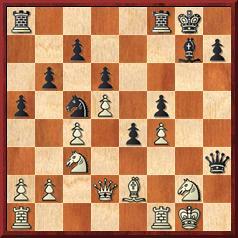 Radjabov scored three wins and four draws on second board, an Elo performance of 2808. 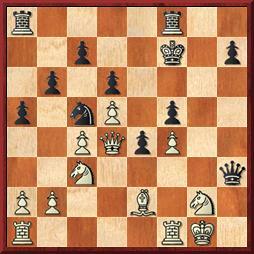 The King’s Indian Vescovi-Radjabov was a pretty win. Vescovi (2660) doesn’t lose often with white, only one loss after 2006 before the game against Radjabov, and that came almost two years ago. In the position below Radjabov has sacrificed a piece and Vescovi’s latest move was 23.Qd2, intending to follow up with Qe3. One possible continuation would have been 25. … Rg8 26. Rf2 Rg3 27. Bf1 Rag8 28. Rd2 Qh4 29. Nd1 R8g6 30. Rc1 e3 etc. Vescovi probably looked closer at that line since he spent half an hour before deciding to go for 24. Rfe1 instead of Qe3, but it only lost even quicker.